here, but about the little things that creep into our lives. The things we take for granted, then assume we can't do without. still stand by my resolution. Well, I probably could write without tea, but it wouldn't be nearly as much fun. . . 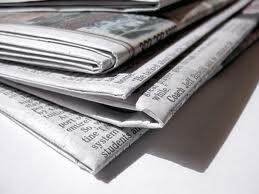 But I recently discovered that something I'd thought a necessity was surprisingly easy to give up--the daily newspaper. I grew up in a household where my parents read both the local paper, the Dallas Morning News, and the Wall Street Journal, so newspapers had been a part of my life for as long as I could remember. And I'd subscribed to the Dallas Morning News for, well, most of my adult life. It was such a part of my morning routine: flipping through the sections to find the ones I liked, perusing them over breakfast and then another cup or two of tea. But the paper got smaller and smaller, the subscription price didn't go down, and I found I was getting most of my news online. So at the beginning of the summer, after a lot of agonizing over the decision, I went cold turkey. No "Just the Sunday edition." No paper, period. And what I've found is that I don't miss it at all. Not the least little bit. In fact, it's been liberating. I can read a book while I eat my toast. Or listen to a book. Or make notes for my own book. 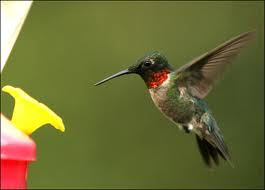 Or--the best thing--stare out the kitchen window at the hummingbirds zipping around the feeder. Quiet time. I am not advocating or applauding the slow decline of print newspapers, by the way. I am as distressed as anyone over the demise of many of the best book review sections, and perhaps if the DMNs hadn't become a shade of its former self, I'd have found the parting harder. But for me giving up the paper has been a welcome bit of simplification. What about you, Jungle Reds? Are there any little things that steal your time that you might find you could do without? ROSEMARY HARRIS: It's hardly original to say that the computer is stealing my time - but that doesn't make it any less true. One thing I've done to fight back is to turn off the sound notifying me that I have a new email. I felt like a complete dope for never having done it before. And I suppose I could live without watching the early rounds of a tennis tournament - do I really need to see Rafa Nadal humiliate some poor guy from Uzbekistan? What I can't do without are my periodic walks around my garden. A few times a day I feel the need to "walk the back 40" as I refer to it. I prune, I plan, I think, I chill. Then I come back and sometimes check emails. LUCY BURDETTE: (AKA Roberta) We get the NEW YORK TIMES delivered daily. There are plenty of days that I can't get through all of it, but I nibble on it across the day--a little at breakfast, a little at lunch, and then maybe a bit more while making a cup of coffee. And Sundays, forget about it. I would HATE to give up the real estate and style sections. Not that I'll ever own a place in New York, but I love reading about the hunt for the right apartment. And the food section on Wednesday, of course. No not giving those up Debs! DEBS: Okay, I have to confess. I do miss the food section. My friend usually saves it for me, but I have about three weeks worth of those I haven't read (maybe partly because it's too hot to even think about cooking here.) And you are talking about The New York Times, which I think would a little harder to part with . . .
HANK PHILLIPPI RYAN: Yes, we do "the back forty" too--every night when we get home from work. Lovely, and now the dahlias are starting. But--my addictions have to do with food, too. And they're like--serial addictions. For awhile, a few years ago, I was craving toasted sesame bagels with strawberry jam. I mean--I loved them, wanted them, had them every day. I could have lived on only that. Before that, it was-and you can tell it was when I was single--baked potatoes with sour cream and broccoli. Honestly, I would start thinking about it on the subway on the way home from work ,and I just could not wait to have that for dinner. I bet--I had it for a year. And then, just like the strawberry jam bagels--there comes a moment when I think--ACCK! Never never never again. And Debs, we've gotta talk. You can't give up the newspaper. Gosh, I really couldn't. If I don't read the papers in the morning, I feel like--I'm missing something. And Sundays? Ritual. RHYS BOWEN: My kids have always told me that I'm addicted to tea at tea time. Have to have my cup on the dot of 4 p.m. On the beach in Hawaii I'd suddenly leap up and start looking for a tea shop while the kids teased me. Facebook--I'm on the way to becoming addicted. Project Runway for a while. Now I've taken the twelve step and I'm over that. I wish I had a garden to walk around--I'm on a hill so steep that only the deer can walk without slipping. I could watch tennis non-stop every day--even Raffa against a guy from Uzbekistan. And I'm thrilled to say I have two days of tennis next year at the Olympics. Yeah! HALLIE EPHRON: Say it ain't so, Debs - you gave up the NEWSPAPER?! Sure, there are "little things that steal [my] time that [I] might find [I] could do without, but my morning paper isn't one of them. I get up and write; and after a few hours the paper is my reward. The real on paper paper -- reading it online is so not the same experience, don't ask me why. What I wish I could do without: blow drying my hair. And I so agree with Ro - the big time sink is the computer -- specifically the Internet. On a good day I disconnect from the network when I start to write. DEBS: Hallie, there wasn't much left to read in the Dallas Morning News. Funny, I read more than one paper every day obsessively when I'm in the UK. But you are all right about the internet. I think I'm going to have to start going somewhere without wi-fi to write, and turn off my phone. Don't get me wrong, I love my phone, but with smart phones you NEVER get away from it. 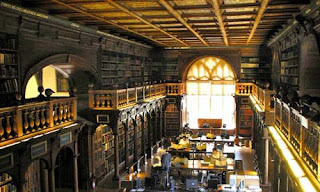 Unless, of course, you can go somewhere like the Reading Room in the Bodleian Library in Oxford, which is not only my fantasy work space, but a little tease for the upcoming week. Later this week we have Susan Conant chatting about her new Holly Winter book, Emily Arsenault on In Search of the Rose Notes, and on Friday, Deborah Harkness will be here to tell us some unexpected things about one of this year's publishing sensations, A Discovery of Witches. You've got tix for the Olympics?? Wow...very cool. I'm going to the US Open 3 days this year. Blow drying my - hate it. Here's a tip - I got a Brazilian blow out last year and it cuts drying time to nothing. Highly recommend if you can find a place that doesn't use formaldehyde - although how would we really know? As a life-long dedicated newspaper reader (The New York Times), I can't imagine giving it up. And I say this despite the fact that the Times has made it clear to me that I am NOT of interest to THEM. I do read several papers online as well, but my reading behavior between the two media, print and online, differs significantly. I can skim or read casually far more easily in print than online and if you want me to look at advertisements, it's print all the way. However, online is all about checking for updates. Despite my addition to newspapers, these days, I do read significantly less because I find myself feeling totally and completely overwhelmed by the constant stream of depressing news. I took the local paper for a while when my son was playing high school basketball, but I gave up on newspapers after I left the biz in 1978. Watergate changed journalism forever -- crusader rabbits took over -- and I can no longer believe "the facts" that I read. Old School was balanced. Now it's partisan. JMHO. I am currently giving up ice cream. I think about chocolate sundaes every night after dinner. Wow, what a line-up of guests, Deb! And the library..sigh. I'm trying to give up sugar. I just can't do without it, though, in that first morning coffee. Blowdrying! Yes! When we're on vac, I don't do it--and there's so mush free time! It really illustrates how muc htime it takes whne you start "not-doing." Give up SUGAR? She said, munching on a piece of wheat toast slathered with Peter Pan peanut butter and raspberry jam (aka breakfast)?? No way I'm giving up newspapers. I started when after my father left for work in the morning, I'd pour the last cup of tea from his pot and read the paper (the Philadelphia Inquirer) he'd left open on the table, while I waited for the school bus. I've never stopped. In fact, when I lived in the San Francisco Bay Area, I'd read both local papers (while commuting into the city by BART)--it was kind of fun comparing the liberal and conservative viewpoints each day. My husband never got into the habit, and I've tried to explain to him why I think it matters. The best I've come up with is that while I don't read every article every day, over time I arrive at a cumulative picture of what is going on, and what the newpapers publishers and presumably readers think is important that we know. So it's kind of a multi-dimensional process with a time element. We gave up our local paper a long time ago. We live in a super conservative district (John Boehner and Jeanne Schmidt), and the newspaper was always so biased it was ridiculous. When they were actually reporting on something other than sports, that is. The funniest thing happened, though. We got a free paper about four days a week, for two years. Since we were dividing our time between our home and our farm, I didn't want the paper laying out on the drive for days, so I tried several times to cancel it. But since we weren't paying for it, there was no one to call. Never did figure out why it came, or why it stopped. No loss, though. Hank, when I was single I had a glass of OJ, and a raisin English muffin with peanut butter every morning, for years. Then I was done, and haven't had that since. *They* will pry my coffee mug out of my cold, dying hands. That's my one true addiction and I'm not giving it up. No way. Huh-uh. Fuggiddaboutit! After I retired, every morning I checked the obits (just to make sure I was still alive) and then worked the crossword puzzle while drinking coffee. I gave it up when I received my first contract and shifted into OMG THIS IS MY JOB mode. I eventually stopped reading the paper and we cancelled the subscription. I haven't missed it. Newspapers are a deep pleasure for me also. Like Hallie, I like to hold newsprint in my hands. Can't see myself giving that up. Last week we were on vacation, out of cell phone range with no internet connection. Addictive things we did have: Maine wild blueberries multiple times each day. Afternoon swims in a lovely private cove. A screen porch that allowed us to watch the fireflies as darkness fell. Red Sox games on the radio. Best of all, I had plenty of time to write. Finished my WIP. Plenty of editing lies ahead, but the story is complete. Brenda, your addictions sound like heaven. Karen, with ya. YUM. And then: DONE. I'm addicted to arguing about politics, but I'm about to give that up. There's no convincing some people that the sky is really blue. Sigh. Iced tea. My sisters tease me because unless the temp dips to below 20 degrees, I've got a glass of iced tea with mint in my hand. I've given up the sugar (a1c is creeping up) and lemon (causes allergy reactions to other things), but not the mint. I use Boston’s Mint Tea to make it. Order a case off the Internet couple of times a year. My gotta have is a bagel with scallion cream cheese. My theory is if I want it bad enough to go get it, I can have it. And Coke. I won’t let Hubby buy that it when he food shops. I have to go get it or do without, otherwise I’d drink that instead of the iced tea. The newspaper? I’m married to one of those don’t-touch-my-paper men, but every once in awhile I have just have to read it. Usually I find something important that day. I do check out the local and national headlines on the Internet a few times a day and watch the news every night. My twin sister, who is news and weather addicted, tells me that is not nearly often enough. My number one addiction is my morning coffee. Not coffee in general, mind you. I don't drink it all day long, but I HAVE to have at least two cups of coffee in the morning. When school is going on, I only have time for two cups, but during the summer (ahhhh.... summer!) 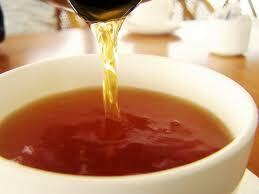 I have time for three and sometimes four cups. My other addiction is my Franklin Planner. I can't do without it. It is my brain in a binder. I know I can keep my calendar and other important information on my smartphone, but that just doesn't work for me. There is something reassuring about having all the important things in my life written down. I think we must be really weird in our house. We don't watch TV news, unless there's something going on with the local weather, or some sort of national or international catastrophe. I very seldom listen to the radio even when driving. Distracting. And being alone in the car is usually good plotting or dialogue inventing time. I do keep up with what is going on in the world on the internet, but I find the constant barrage of TV and radio news and blathering pundits to be both stressful and extremely negative. I'd have to say pop for one. I gave it up during my weight loss but it's creeping up on me. Have to kick that in the bud. Also, email. I'm always stopping to check and see if there are new emails, and if I hear the ding on my phone, I have to check. Drives me crazy. We had no choice but to give up the daily newspaper in Ann Arbor. It shut down. No one had to go cold turkey, however. The paper had been shrinking so, like the Dallas Morning News, for several years and we were all weaned by the time the Ann Arbor News died after something like 135 years. Country weeklies seem to be flourishing though.